Samsung has introduced this week its first 32GB RAM memory module, the first in the market and it comes with a new manufacturing process of 40 nanometers. Even though, they are far away from our domestic computers, it is a solution that we will certainly see after a few years. 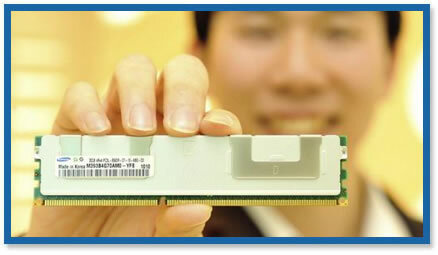 This new DDR3 module is oriented to servers and will be sold from April, when they will start the massive manufacturing. According to Samsung, with the change from 50 to 40 nanometers they were able to duplicate the total memory for each module (from 16 to 32 GB) maintaining the energy consumption. They are RDIMM modules that could only be used in base boards, being totally compatible with the domestic boards we have at home. Prices have not been revealed, but being a product guided to the professional field (not only workstations, but also servers and racks) we could expect something really higher than regular prices. We have to consider that with the use of these modules it could be duplicated the maximum capacity of a system in relation to the use of 16GB modules of previous generations, which can give rise to a notable increase in the efficiency of the equipment under certain executions. As we have already commented, the 32GB RAM modules are still far away from our homes and our computers, but they will certainly arrive. Samsung has also confirmed that, facing the second semester of 2010, they will start manufacturing new RAM memory modules under the manufacturing process of 30 nanometers that will represent a new step, even higher than the 40s and even the regular 50 nanometers, allowing the use of a higher amount of memory for each module that will also be more efficient.